Hindu temple - sketch has written on the bottom, "washed with tea and condensed milk". A temple in Little India, Singapore. These things used to drive me mad, just far too much detail to absorb, where to start? Hilary (SWIMBO) and myself had managed to get a footpath table at a cafe opposite the temple and I had a couple of magic cups of thick black tea sweetened with.....condensed milk. It may sound horrible, but there was no other milk available, so "when in Rome" and all that. I reached for my pen and book and I just squiggled about, making no attempt at a recognizable figure anywhere. I figured if I did one I would have to keep going and do the lot. I'd have lost the plot for sure. As per usual I did the wash with the material on hand. (While medium was a bit thick for thin for misty effects there's no doubt it blocked in the shadows. Looking at it now it is easy to see that I can add a bit to the right hand side to make it look better, but if I was aiming for perfection I would have used a camera. As it is I can still taste that tea. You don't get memories like that in Starbucks. We stayed a week in Little India in Singapore and loved it. Vibrant and bustling. 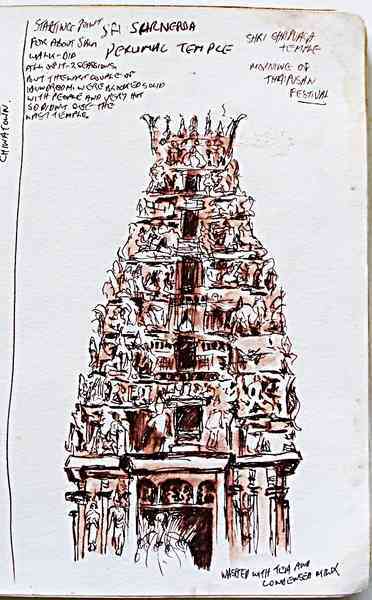 The morning I did this sketch was a huge day for the Hindus in Singapore. 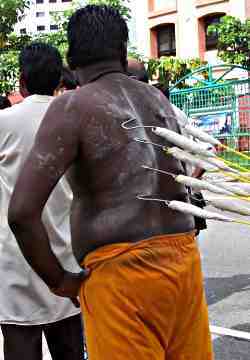 It was the day of their annual Thaipusam festival. The streets were closed to traffic along a route of about 5 Km and the devotees walk with various hooks, spears, needles etc. piercing their skin. I guess that many see this as way of showing their devotion, proving that their faith can overcome physical pain and suffering.